MY-SAFETY-ASSISTANT is a service offered by DR-WALTER to its customers. 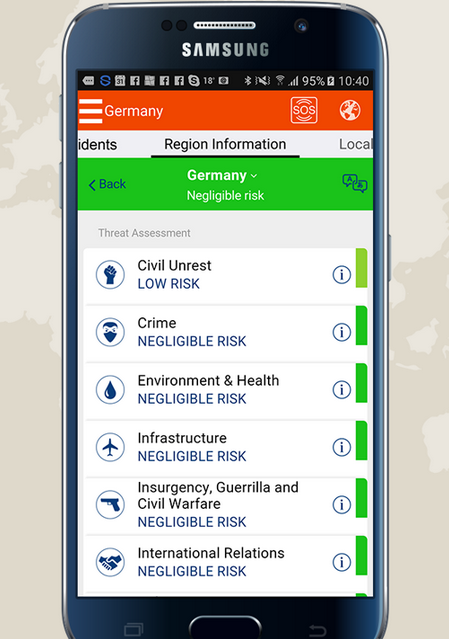 The app keeps you and your loved ones safe and helps you to avoid threats while staying in touch wherever you are. A user-friendly interface and minimized battery use are just two of the features that characterize MY-SAFETY-ASSISTANT. On this page, we have compiled an overview of the app's content-related features for you. In most cases, security risks arise unexpectedly. Direct push notifications inform you immediately if the security level changes. The notifications are marked in 3 colors categorizing the warning level. Green announcements inform about general events, yellow warnings represent a negative influence for everyday life. Critical events, which require a reaction, are marked red. Warnings of the red category will additionally be sent by SMS. Once you have chosen your destination country, MY-SAFETY-ASSISTANT offers you a wide range of safety and travel information including advice at hand at every location. This is especially useful prior to your journey for preparation purposes and gives you a good overview of what to expect abroad. 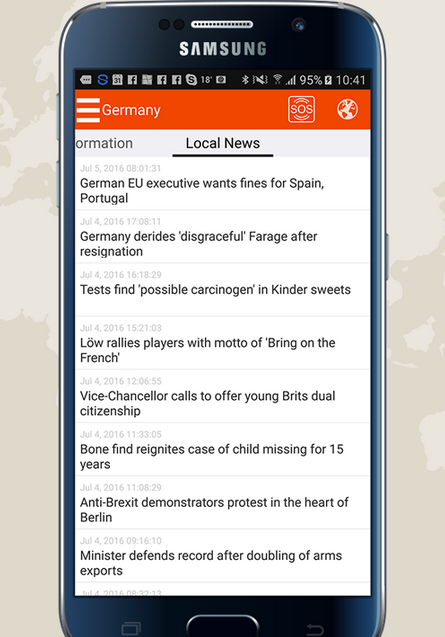 The app offers you local news in English for whatever country you visit. 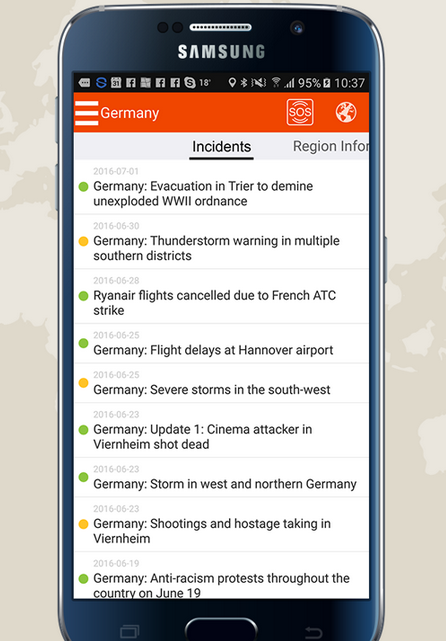 Through one click you can change the country of your interest and check the corresponding news and warnings. 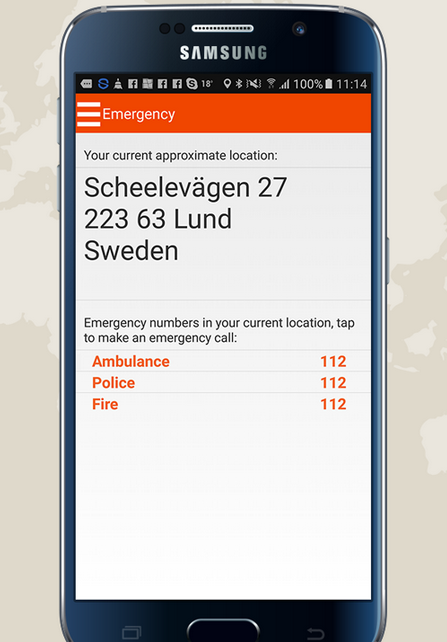 In case of an emergency, MY-SAFETY-ASSISTANT is able to detect local SOS emergency numbers worldwide with one click. Listed emergency contacts are police, ambulance and fire squad. MY-SAFETY-ASSISTANT allows you to 'check-in'. 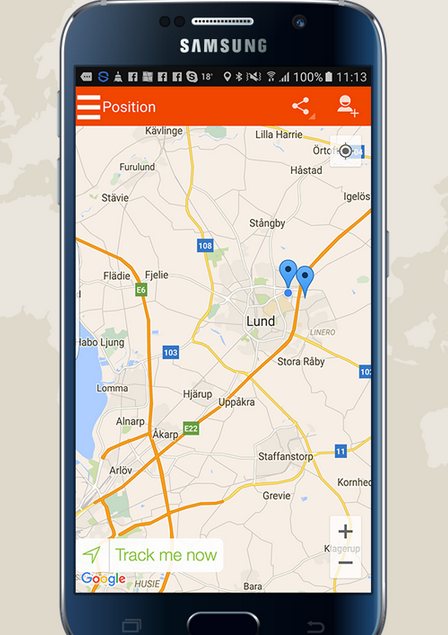 Via the app you can let family, friends and colleagues see your exact position and track you as you travel to new destinations. Walking home alone at night in an unfamiliar neighborhood? MY-SAFETY-ASSISTANT allows you to alert your friends and family and give them a real-time trail of your movements. MY-SAFETY-ASSISTANT offers automatic translation of messages and texts into 90 different languages.